The iPhone’s Voice Control feature is present for quite some time in the iOS. If you’ve ever used a passcode on your lockscreen for protection, you should be already familiar you should disable the Voice Dial from the settings otherwise everyone can call anyone he likes. Well, enter the much more capable iPhone 4S Siri. Guess what, it would still work from your lockscreen by default even if you’ve set a passcode for your iPhone 4S. You can already imagine how someone who gets access to your locked phone can perform all these clever tasks you’ve seen on the demos like extract all sorts of info about you, your regime and they can even call whoever they like. Ouch! On the iPhone 4 you are in much the same danger with Voice control though it’s far less capable and versatile than Siri. Still, gaining an access to someone else’s locked iPhone 4 would still allow you to dial any of the saved contacts, but also you can dictate a number yourself. To protect yourself from these sorts of perils, it’s best that you dig in your Passcode options. 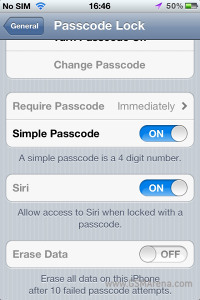 From there, you will be able to turn off the Voice Dial or Siri functionality on the lockscreen. And we can imagine that if you’ve gone through the trouble of using a passcode on your phone, then privacy is a major concern to you. So, you are welcome. Whatever model iPhone you are using, you should take your time configuring the thing properly. Thanks for the tip about the issue, Weng Chin!